If you have ever hit a cricket ball for four runs, smashed a drive down the middle of a fairway or lashed a passing shot down the line in a tennis match you’ll understand what it means to find your sweet spot. 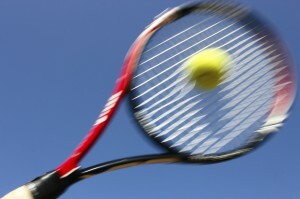 It’s that part of the bat/club/racquet that gives the greatest return on your effort. As a project manager, you have three critical skills and knowledge areas, and when you get them working together in balance, you’ve found your project management sweet spot. And the more you understand those skills areas and how they interact and inter-relate, the bigger you can make that sweet spot. As a project manager you have to understand the business environment you are delivering into and have at least an understanding of the skills required to deliver your project, be they engineering, technology development or deployment, product development etc. 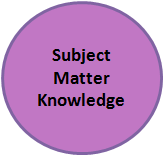 Deep subject management knowledge can be great for specific projects and many project managers have developed strong careers through specialisation. But this can represent a risk to career development especially if your area of expertise becomes out dated. Also, you miss the opportunity for learning from other business disciplines and applying them in your current area. You need enough business and technical knowledge to understand the business requirements and the challenges in delivering against them. You need to be able to relate to business concerns, risks and issues. You need to understand the wider business picture. You need to be able to prompt and challenge when solving problems and developing solutions. The best project managers have the ability to rapidly assimilate a new business area, to rapidly understand the key aspects of a business situation. They have an enquiring and analytical mind and a willingness to ask questions, especially the seemingly dumb ones! In my experience they are often the ones people are afraid to ask (in case they appear dumb) and are the most revealing. 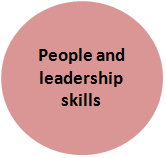 Area 1 is where your people skills interact with your business and delivery skills. They enable you to understand what and how to communicate with your team, your sponsor and key stakeholders. The more you understand of the business and the delivery skills of your team, the easier that communication becomes. The better your communication skills, the easier it is to get your message across. 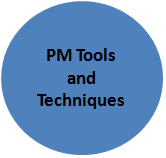 Area 2 is applying your PM specific skills appropriately to your business area. Don’t try applying rigid EVA techniques to agile systems development, or try to apply too much pm process to forex traders in money trading systems development. Horses for courses! This is an important area where you learn how to communicate the need for a certain amount of process and discipline (even for rowdy traders). You have to learn how to sell the benefits that the process brings and how it can same time and anguish in the long run. This is the true sweet spot, where all your skills come together. Communication is the key here. It is the core to applying your PM skills, to using your business knowledge and leading your team to successful delivery. Understanding your skills and how they inter-relate enables you to develop and hone them. As your skills grow, confidence grows and with that your ability to lead effectively. What are you going to do this week to grow your sweet spot? ‹ PMO Best Practice – does it really mean anything? 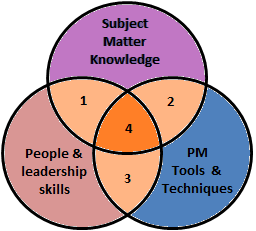 I share the same 3 skills, however I put tool and subject matters as one, which I call technology and I add Business as number three circle, because I think that understanding the impact of the end products and services is an important skill as well. This post is excellent. Yes, success is not one or the other. It is important to have the correct balance between subject matter knowledge, project management knowledge and leadership skills. 1 Pings/Trackbacks for "The project management ‘sweetspot’"